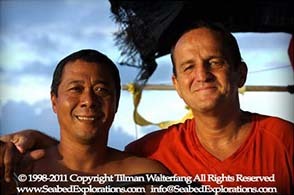 Image above: Tilman Walterfang, founder and owner of Seabed Explorations NZ Ltd. together with Mr. Mensalna Amat Marwi (Indonesian survey assistant): Taken during the filming of the National Geographic Documentary entitled Secrets of the Tang Treasure Ship. Underwater Cultural Heritage (UCH) is unique, in that it not only preserves a snapshot of a particular culture at a particular time in history, but it also has global significance, because it consists of a ship of one cultural origin, carrying cargo often of different provenance, that has wrecked in yet another part of the world. In this respect, it represents the shared cultural heritage of humanity. Further, quite soberingly, it is a non-renewable resource that is constantly dwindling, beset by both natural and human destructive forces. The world is divided into two positions regarding the treatment of UCH. On the one hand, there are those 'treasure-hunter' opportunists who utilize the latest surveying and salvage technology simply to get their hands on artifacts with the aim of selling them to the highest bidder. Such plunderers of the world's cultural heritage destroy the valuable cultural information of a wreck before anyone can collect it in a database for posterity, and dissipate the value of artifacts by dispersing them around the globe to private collectors. 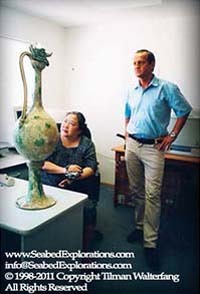 Image above: Tilman Walterfang, founder and owner of Seabed Explorations NZ Ltd. together with Mrs. Pamelia Lee during one of her many visits to Seabed Explorations New Zealand; Mrs. Pamelia Lee is credited with initiating the acquisition and transfer of the Tang Collection into the stewardship of the Singapore Tourism Board. While such opportunists are to be despised, the opposite approach is in fact little better and it has its drawbacks as well. In that camp are those (among them we find many archaeologists) who insist that all shipwrecks should be left in situ -on the bottom of the ocean, for their cargo to be eventually studied when the opportunities (and funds!) become available. 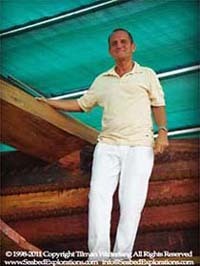 Then if a cargo is eventually raised, they argue it should be stored on land in its totality... with no trading whatsoever of salvaged goods taking place, even cargo having apparently little historical significance, such as a multitude of duplicate copper, tin or bronze ingots; or hundreds of thousands of coins of the same kind. The purist position requires that the majority of historically significant wrecks will remain unexamined for generations to come, leaving them at great risk of natural erosion or human interference; and by taking such a hands-off approach, these "purists" risk the irretrievable loss of the very cultural heritage they presume to protect. As a result, in effect, every day the world irretrievably loses pieces of the puzzle of human history. Since 1994 I dedicated the majority of my energies to the complex challenges of management of Underwater Archaeological projects and over time I have observed that the political stance of one faction of stakeholders in such projects has hardened considerably. Yet there appear to be only a few scholars who genuinely contend that it is an intelligent approach to draw such battle lines, by oversimplifying what is, in effect, a complex issue; and as a result, all too often, ill-informed and spurious arguments are perpetuated unnecessarily. It is a matter of fact that the shipwreck cargos at stake are a multi-billion dollar resource. As regards the need for an appropriate management model, realistically no internationally enforceable consensus has been put forward to date. 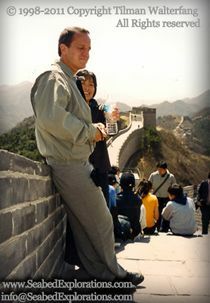 Tilman Walterfang, founder and owner of Seabed Explorations NZ Ltd. at the Great wall of China, during an official visit to Beijing Imperial Palace Museum. Together with the archeologist and Asian art historian Ms. Chen, Yuh-Shiow.